I finally had a chance to sit down and make some samples from the Valentine Bundle that SU has put together. I have a Stamp Camp on Saturday and I wanted to have some other things besides the projects (which I'll share later!!) for my ladies to peruse! I have lots of ideas roaming around in my head but I am sure my DH would like to have his dinner sometime! 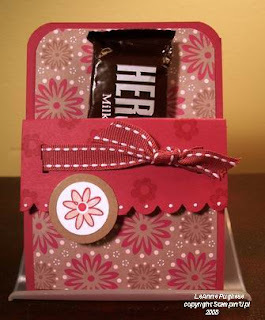 The box of pretzels is a shameless case from Melanie Muenchinger's blog--hers is MUCH cuter, but I had to adapt, so hopefully it will give you some ideas for you to use on your own. 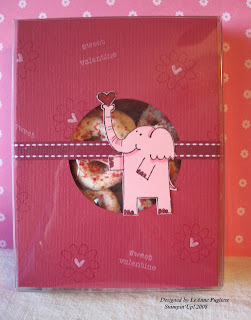 I also CASE'd the elephant with the cupcake from someone on SCS, can't remember who, but thank you for the idea--so sweet! Enjoy! 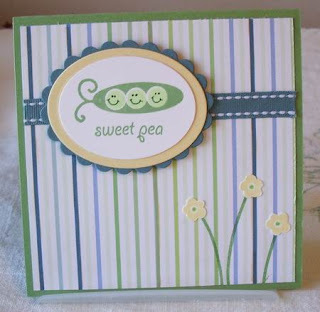 This sweet little card is a challenge for Sharon's Scallop Challenge. We had to make a card using some sort of scalloped edge. I made my scallop with my corner rounder. I took off the guard and held the punch against the edge of my DP. I started in the center and made the first punch, continuing on to the right, because I am right-handed. Then I flipped my paper over and continued from the center punch, again working to the right. It makes a nice wide scallop; I could have used scalloped scissors, but I liked the effect of the punch. I got some really cute ribbon at Michael's yesterday while visiting my dad in Rehoboth....I couldn't wait to use it with the Flowers For You DP from SU! The colors are so nice & springy! With these gray skies, I needed something cheerful today! 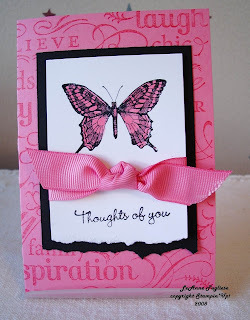 I stamped the sentiment right on the ribbon with Stazon ink. The Dazzling Diamonds glitter really made the little flower stand out, too! I haven't been home much, so I haven't stamped anything to show, but I did get some cute pictures I thought I would share with you. 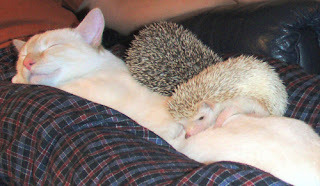 You know how you get those animal photos passed around via emails, but I hadn't seen these. Can't give credit because I don't know where they came from; hope you enjoy them! I visited my local Dollar Store very quickly yesterday--I was in a time crunch, so I couldn't browse too much! But I found some really cute DP and just had to get it---it was only a dollar, right? So these are two really quick cards I came up with--no challenge here, just off the top of my head. I didn't want to cover up the pretty paper too much, so I stamped the "friends" sentiment in vellum cardstock, colored it with markers and added some of SU's Fire Circle brads. 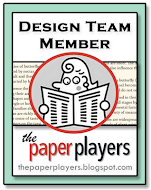 They are both mounted on Soft Sky cardstock--all pretty basic. I did heat emboss the butterfly so that I could freely watercolor the design without the outline getting all blurry, that's about the most challenging thing on either of them! I left the sentiments off the inside because I like to add them as I need them. 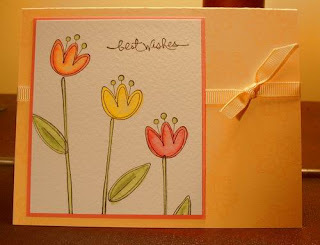 These could be birthday, get well, or just an uplifting card! 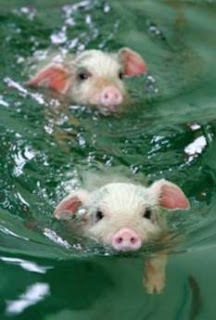 Hope they bring some cheerfulness to your day! I had a nice surprise in the mail today--a hand-stamped card from my friend Beth! Isn't this a beautiful classic card? I love how she framed her image in black--not once, but twice! I have been using a lot of black accents myself lately, so this really appealed to me. Thanks so much, Beth. She cased it from someone on SCS, so whoever you are, thanks also! I needed a quick sympathy card today. 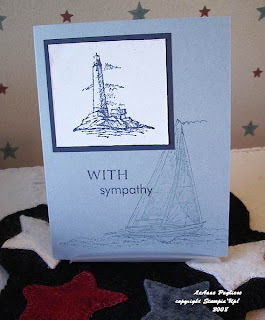 I had just gotten this stamp to use for several family members and friends who like boats, lighthouses, etc., and it seemed perfect for the card I needed to make today. Very simple (aren't mine always) and easy. 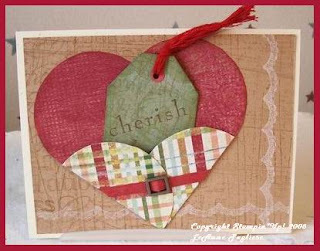 I distressed the Naturals cardstock with my distresser; the sentiment is from Papertrey. Enjoy your day! This is a cute SCS challenge from yesterday (it's a little late) that was so easy, I am calling it the "Lazy" Pixie Pouch! I found a Hershey bar in my freezer that escaped being eaten at Christmas, and the new Berry Bliss designer paper seemed to match it perfectly. I found a card that I had already scored and messed up in my In Color folder (Purely Pomegranate) and just cut off the bad parts, folded down the top edge, cut it with a pair of retired SU scallop scissors (why did they do that?) and tied it together with PP stitched ribbon. There is no glue holding the pouch together, just the ribbon coming through the front flap. I stamped one little flower from Holiday Blitz, punched it out& adhered it and I stamped a little flower from Enjoy Every Moment on the flap and dotted it with my white gel pen. Too easy but CUTE, doncha think? I think this says STAMP CAMP PROJECT on it! 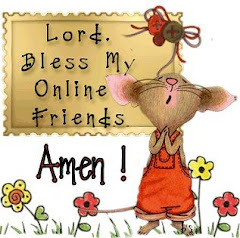 Just a quick posting today, I have to go to work sometime! 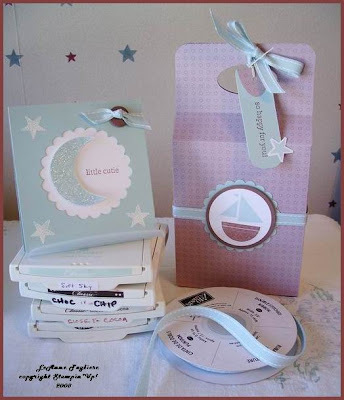 This box was designed by Lauren Meader, a wonderful crafter who shares her ideas & thoughts so freely! You can see her details here. I always tend to do baby things in girlie colors, so I wanted to make some boyish things. This box would be cute for a onesie, some little toys, a comb & brush, whatever! When I punched out the scallop for the box, it left a nice little opening in my cardstock, so I decided to make a matching gift card! The moon is embossed in Iridescent Ice EP; I stamped it first in Soft Sky, then lined it up with my Stamp-a-majig and reinked it with Versamark. Then I embossed it, cut it out & mounted it on a piece of white cardstock that fit behind the scallop. The stars are stamped in White Craft, then embossed with white EP. I used the punchout from the box handle to put on the little tag. Today has been very cold and very windy. As I was watching the sparrows, juncos, chickadees and downy woodpeckers at our feeders, I was amazed at how they held on so tightly. The woodpeckers particularly caught my eye....they hung on with all their might to the little suet cages, pecking at the seeds. The wind blew them this way and that, but they still hung on, focused on their needs, knowing that despite the wind, the food was there. How much are we like those little birds? The Lord knows our needs and despite the winds that blow our way, buffeting us sometimes until we feel battered and lost, He continues to feed us if we trust in Him. "The rain came down, the streams rose, and the winds blew and beat against that house; yet it did not fall, because it had its foundation on the rock." Matt 7:25. Who is your rock? This card fulfills two SCS challenges here and here. It is fun to do these challenges because you don't have to reinvent the wheel, or maybe I should say card....someone else has come up with idea, you just sort of fill in the blanks! I am sending this to a dear sweet lady in our church who has been having health issues and hasn't been able to attend lately, and I wanted to let her know we were thinking of her. 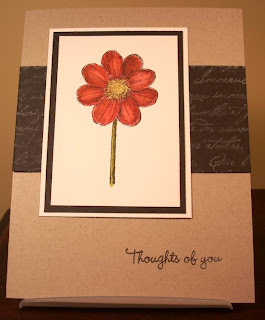 The background is retired French Script, stamped in Very Vanilla; the flower from Touch of Nature is watercolored with my aquapainters and reinkers. I seem to be doing a lot of watercoloring lately, and that set lends itself well to that technique. 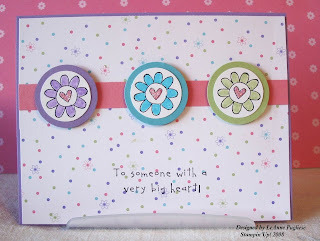 I am lovin' the little sentiments from My Favorite Things, called Essential Sentiments. Lots of good ones in that set! Enjoy! Woohoo! I did two challenges yesterday. 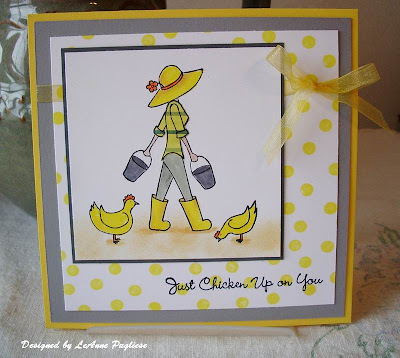 This one was from Sharon Johnson, who has a wonderful blog full of great ideas. Her challenge was to use tearing. 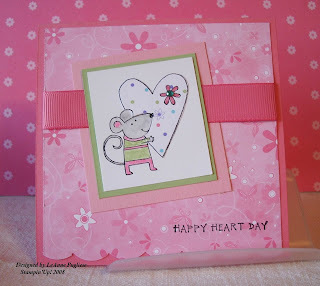 Mine is fairly simple, as she suggested, and it is a note card, so it is a little smaller than a regular card. I just received my Valentine Bundle from SU, so I have all this beautiful grosgrain ribbon calling my name!! Hope you enjoy it. Well, I just said goodbye to my hubby (in the blue shirt), my pastor (with the wheelbarrow) and 12 others from my church as they drove off to the airport. 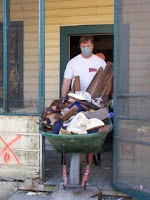 They are on their way to Lagniappe Church in the gulf region of Mississippi to do post-Katrina construction work. Two others left yesterday with tools, suitcases and food. This is the 7th trip they will be making; they are teaming up with another church member who took a missionary job there. 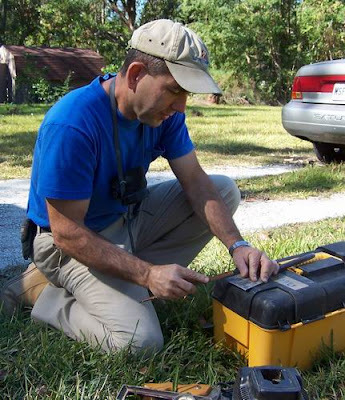 He sets up all the construction jobs and sends out the various teams to the necessary job sites. This is my husband's second trip; our first trip, on which we both went, was a month after the hurricane hit. The damage and destruction was incredible. This trip will only help a teeny tiny bit, but they are a committed congregation, and every little bit helps. During the planning of the trip, their Bible study was from Isaiah 61. I am sure this passage was their mission statement: "They will rebuild the ancient ruins and restore the places long devastated; they will renew the ruined cities that have been devastated for generations." Even though this passage was about Israel, how applicable it is to our present time! Please pray for them as they travel, work and minister to these families. Today is a great day!! 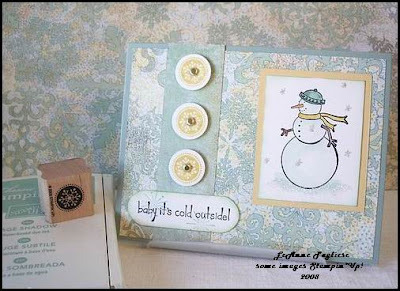 First, it snowed yesterday and today is sunny & beautiful; second, I got to do Beate's challenge; third, I used some Basic Grey Fruitcake paper I had been hoarding, and fourth, I was inspired to stamp a little snowman from Lizzie Anne for the challenge! Although it is not stamped & colored in traditional snowman colors (So Saffron & Sage Shadow), I love it anyway. Those colors match the double-sided dp, so that's what I used. Plus I flipped the sketch around so my snowman wasn't looking off into outer space! I used a Jelly Roll pen to make some snowflakes and added Dazzlings Diamonds glitter at his base. Hope it inspires you! Acc: 3/4" circle punch, brads, DD glitter, Jelly Roll pen, Aquapainters. 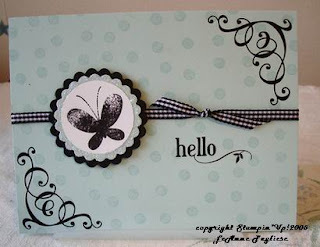 Well, if anyone told me that I would be stamping a solid butterfly in black ink, I'd say they were crazy! But it here it is! I really like the color combo of Soft Sky & Black. The man in brown brought me some new goodies yesterday---a new jumbo wheel called Spunky Spots (love that name) and rub-ons!! So I thought I would play and this is what I came up with. In real life, the glitter around the edge of the scallop is quite sparkly. Too bad it doesn't show up so well in the photo. My daughter gave her seal of approval on the rub-ons, saying she wanted another tattoo just like them! On her ankle. Along with the other one. Oh well! I must say the rub-ons are fun, but they need to be handled carefully--just laying them on the card stock while trying to figure out where to put them, they began to come away from the backing. So be careful! 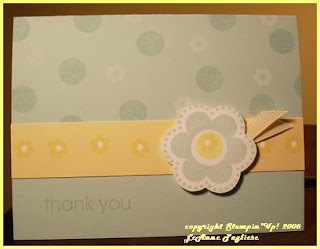 Here is a sweet little note card I made to say "thanks" to someone in my sideline who did a very nice favor for me! She is a fairly new demonstrator and I really don't know her that well, but I hope to get to know her! 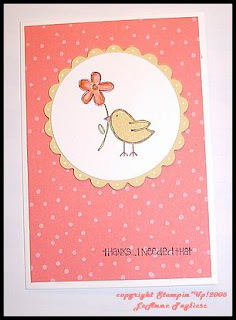 This little birdie is paper pieced with So Saffron Prints Designer Paper. This set lends itself well to that technique, and it works up very quickly with just some ink and a blender pen. 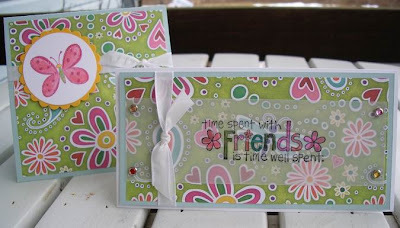 Something I did with these stamps--I cut the sentiment separately and mounted them on the side of the stamp. Now I can use the words all by themselves! Double duty from one set! I also used my Nestabilities circle & scallop dies, added some dots with my gel pen....the only thing I think it needs is maybe some GLITTER!! I'll have to make sure I put some on before I mail it off! Thanks for looking! Isn't THIS a pretty card? My sweet friend Shawn made my day when I received this card! She is such a talented stamper! She has more style in her pinkie than I do in my whole self! I was reading an article on a Kristina Werner's blog the other day about craftsmanship. 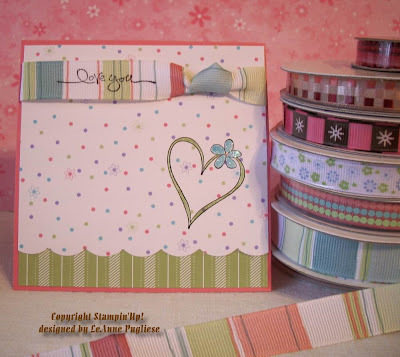 She described it as having all the elements in a card perfect....no rough edges on the cardstock, no glue or dimensionals showing, edges straight, no fraying ribbons...you know what I mean. And Shawn is definitely a craftsman....or should I say craftswoman. Plus I just love pink & brown together! Thanks, Shawn! Well, here is my sad attempt at a Valentine's Day card. It is based on a Splitcoaststampers Challenge here. I love the template they used, but in my attempt to be creative, I just overthought the whole thing. Could be that I was working on this at midnight! I think I will try again with some more traditional colors, because I see lots of potential in it! I do love the Basic Grey Fruitcake paper....I was hoarding it, but the red in this sheet was begging to be made into a Valentine, since I didn't use it for Christmas!! Thanks for looking! I find myself tending to go to the same colors all the time.....I guess I am in a rut! After seeing all the pretty Valentine cards everyone is making, I think I need to break out and do something bold. This isn't it!!! 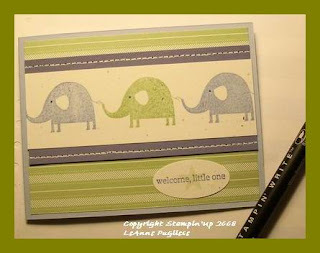 This is just a sweet little card using the new SU Nursery Necessities set. 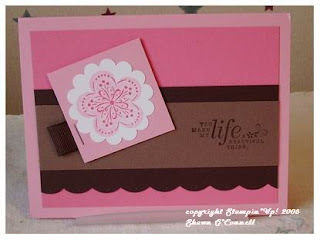 I realized I didn't have any baby stamp sets & thought this had some great elements to use for other occasions as well. The background paper is Flowers for You from SU--this design is a bit more masculine, the others are some adorable florals with some great color combos! I hope to make some more samples in girly colors soon! The faux stitching is done with a paper piercer, mat & a white gel pen. This is a fun technique when you're too lazy (or your stamp table is too messy) to drag out your sewing machine! This past year I really strayed out into the "other" stamping world and began experimenting with stamps from companies other than SU. I love SU, but really felt there were some neat designs, patterns and papers available and I was feeling a little constricted! One of the first sets I purchased was from Papertrey Ink, and I did a challenge at SCS using it. It's called Green Thumb. I thought it would be cute for a baby card. Hope you like it! Hello to everyone! This is my first post to "Blogland" and I hope I will be able to keep up with my blog on a regular basis! Please bear with me as I am learning as I am going! My cards tend to be on the simple side, although I am learning to add more layers and elements. 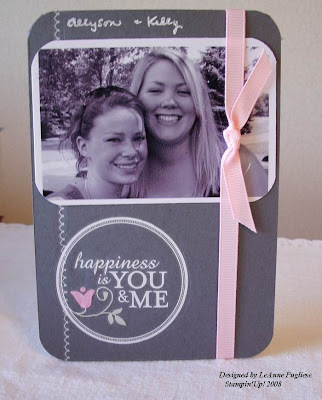 But from a demonstrating standpoint, I think most of my customers, especially those new to stamping, want to see cards and projects that are easily duplicatable. 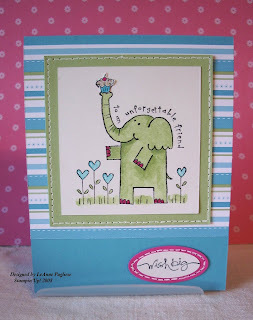 Plus I have a tendency to want to stamp a fast easy card when I need one!! 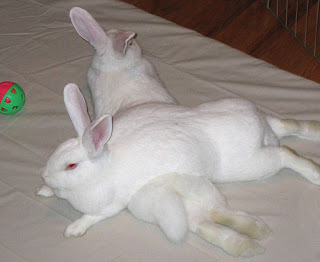 So this first post is just that. 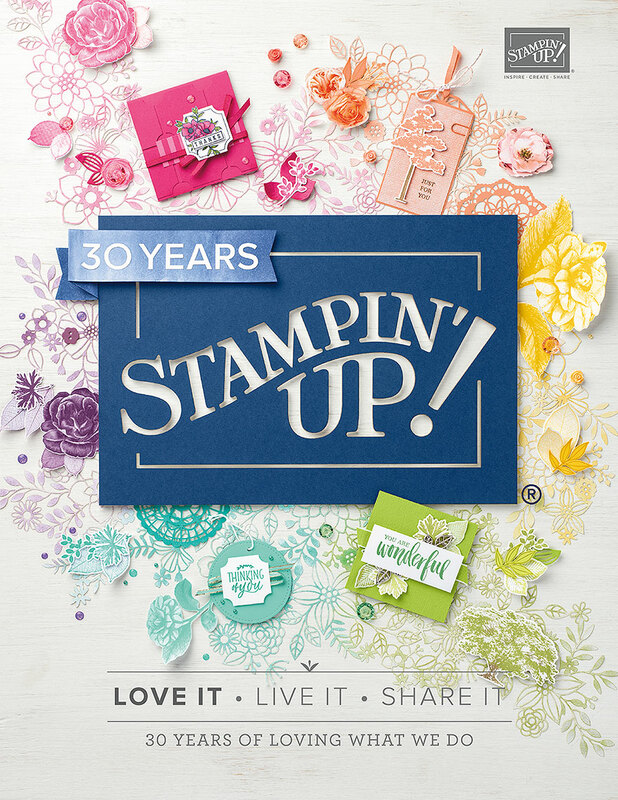 It uses a Level 3 Hostess set that we demonstrators received FREE from Stampin' Up! How nice is that! It is called Time Well Spent. You can view it here. 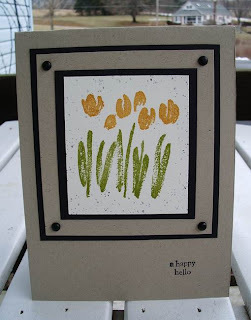 I thought the tulip in this set was very sweet, so I made a nice springy birthday card. I hope you enjoy it!